NEW ORLEANS -- Pelicansstar Anthony Davis openly proclaimed ahead of Sunday's All-Star Game that he was going after the MVP award, and he didn't make his master plan on how to do so much of a secret. "Coach [Alvin] Gentry already told me every time I catch it to put it up," said Davis upon being selected to his fourth straight spot on the Western Conference team. The Western Conference All-Stars seemed to have no problems feeding Davis on his home floor at the Smoothie King Center. The 23-year-old's point total smashed the previous record of 42, set by Wilt Chamberlain in 1962. "I stressed that, I think more than enough, to the guys in the locker room before the game that I wanted to get the MVP for this crowd, for the city, and I ended up doing it," Davis said. "Them guys did a great job of just finding me, giving me the basketball. They wanted me to score 50. Every time, Kawhi [Leonard] was like, 'Six more points.' Or James [Harden] was like, 'I'm going to pass you the ball.'" The honor is the first NBA trophy for Davis, who finished fifth in regular-season MVP voting after the 2014-15 season. Davis placed the accomplishment behind his gold medals from the Olympics and World Cup and his NCAA championship, but called it "an award that I'm going to cherish forever." Davis, 23, also had 10 rebounds. He held off a late MVP charge by Thunder guardRussell Westbrook, who had 41 points, 7 assists and 5 rebounds. Giannis Antetokounmpo led the East with 30 points. "I told the coach I'm going to play hard no matter what," said Antetokounmpo, the youngest player in the game. "That's the only thing I know how to do." Westbrook checked in for the first time with 6:07 to play in the first quarter, joining Warriors forward Kevin Durant, a West starter, on the court as a teammate for the first time since they were in the Western Conference finals last postseason with the Thunder. Durant signed with the Warriors as a free agent after last season. A minute into their time together, Westbrook drove the ball into the lane and hit Durant, positioned in the paint, with a pass. Durant quickly lobbed the ball in the air toward the basket while in midair and Westbrook slammed it in to finish off the alley-oop. The West All-Stars celebrated the connection at the next timeout, as clapping and smiles abounded. "It was just funny, with all the talk and everything going into the game," Warriors coach Steve Kerr said. "I guess that's kind of the beauty of the game ... you just let the game break the ice. That play, I thought, broke the ice, and our guys were all making fun of them, and they were both laughing. It was a nice moment." Westbrook scored 12 points -- all on 3s -- in a 63-second span late in the third quarter after coming off the bench. Then he opened the fourth quarter with another 3, giving him 34 points in just under 14 minutes played to that point. Anthony Davis joins Sage Steele to discuss winning MVP of the All-Star Game, breaking Wilt Chamberlain's All-Star scoring record and how he convinced his West teammates to feed him the ball. 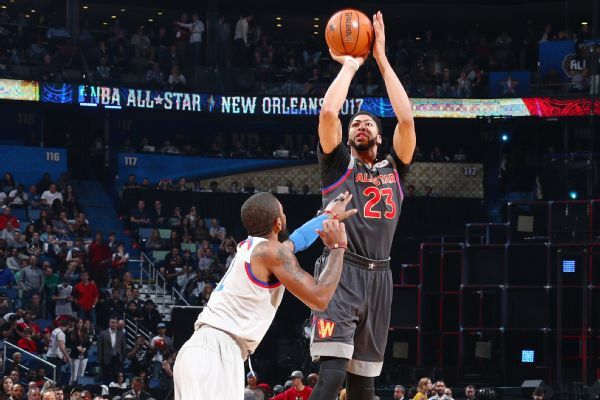 Anthony Davis breaks Wilt Chamberlain's NBA All-Star Game scoring record with 52 points, earning MVP honors as the Pelicans' power forward leads the West to a 192-182 win over the East.